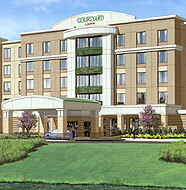 The Courtyard by Marriott is the perfect place to host your team for the big game. Our hotel features spacious rooms with 2 queen beds or rooms with a king bed and a sofa bed. All rooms have free high speed internet access to stay connected with family and friends and check for the latest scores! Relax and unwind after a long day, enjoy our 24 hour fitness center and life-guarded indoor pool and whirlpool. Fuel-up in the morning before the big game with our "Made to order" hot breakfast. The hotel is located only minutes from Baltimore City, home of the Baltimore Orioles and Baltimore Ravens. We are also only 20 minutes from Annapolis and 30 minutes from the attractions and museums in Washington, DC! When you stay at the Courtyard by Marriott Fort Meade, you'll receive first-class amenities and service the Marriott Way! ALL RESERVATIONS WILL REQUIRE A DEPOSIT OF 1 NIGHTS ROOM AND TAX.